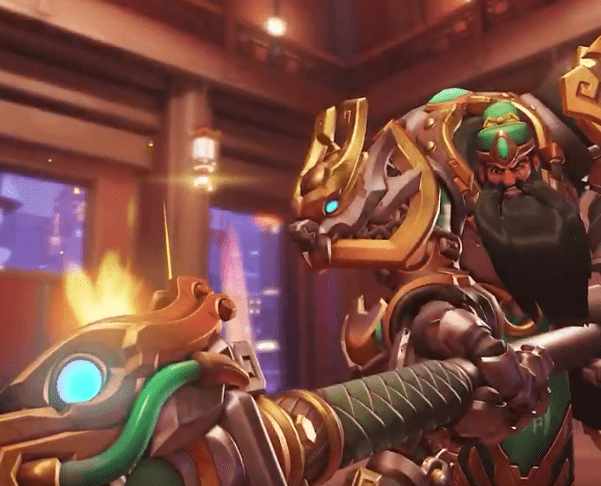 Guan Yu Reinhardt revealed as newest skin for Overwatch's New Year Lunar Event – AiPT! The Chinese New Year continues to deliver new awesome skins. Another day has arrived, and with it another Overwatch skin has been revealed for the game’s upcoming New Year Lunar Event. Blizzard has been revealing one skin each day leading up to The Year of the Pig Lunar New Year event celebration, with Hanzo and Reaper being the first two heroes to receive new skins. Everyone’s favorite shield toting tank has joined the party with the new skin of Guan Yu Reinhardt. As with Hanzo and Reaper before him, Reinhardt’s new Guan Yu skin is inspired by a Chinese general that lived during the Eastern Han dynasty of Imperial China, and was depicted in the historical novel Romance of the Three Kingdoms. Guan Yu has appeared in numerous Chinese operas, film and television series, the manga Battle Vixens, as well as the video game Dynasty Warriors, and the tabletop game Magic: The Gathering. Reinhardt is resplendent in green and gold armor, with a huge black beard and green cap. A Chinese symbol can be seem on the bottom of his tabard, and a gold and jade dragon covers his left fist and right shoulder. The Year of the Pig Lunar New Year event begins Jan 24 and ends Feb 18. Players will have the opportunity to earn new skins, sprays, victory poses, and other unique cosmetics.